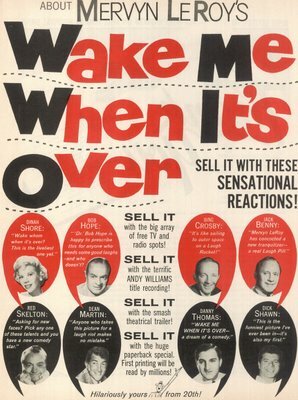 When it comes to selling a movie, everybody’s expected to pitch in. Sometimes it’s a matter of friends calling in favors, or studio employers calling in obligations. Either way it leads to some pretty strange campaigns and combinations. Here are two examples from 20th Fox that I particularly like. 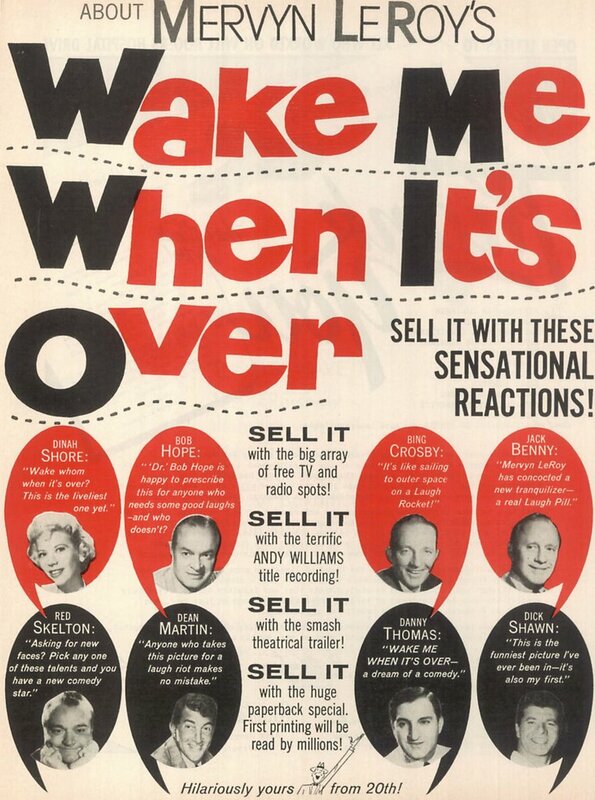 There must be some rational explanation for all those star endorsements for Wake Me When It’s Over, but I can’t imagine what it is. Were they all buddies with Mervyn LeRoy? He’d been around a long time, after all, and no doubt had a lot of friends. Bing Crosby’s bouquet is my favorite --- It’s like sailing to outer space on a Laugh Rocket! Next time somebody asks me what I thought of a movie, I’m going to give them that line --- even if I’ve just been to see Munich or Traffic (that’ll be the day). Joan Crawford may have been a holy terror at home, but there was no better sport in the biz when it came to hawking the product. Here she is giving National Screen a boost with their fortieth anniversary trailer celebration. It’s great seeing big names helping out in an area of the industry that too often goes ignored. 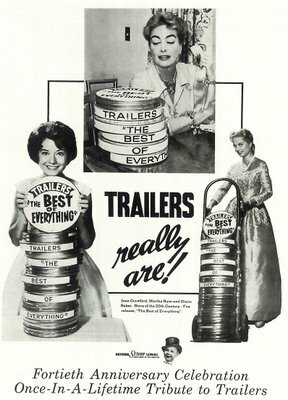 Trailers really are --- The Best Of Everything!